In Old English White with red trim and a black hood. This Frogeye went to the U.S. when new and was repatriated in 1997. It was then completely restored over a six year period, converted to right hand drive and returned to its original colours. There is a Heritage Certificate to confirm the specification. The rebuild is fully documented and photographed. The car is to standard specification and has a rebuilt 948cc engine, drum brakes all round, steel wheels and front and rear bumpers. It has the original mechanical rev counter and smooth case gearbox. It even has an original steering wheel. The hood is as new as is the full tonneau and the side screens. 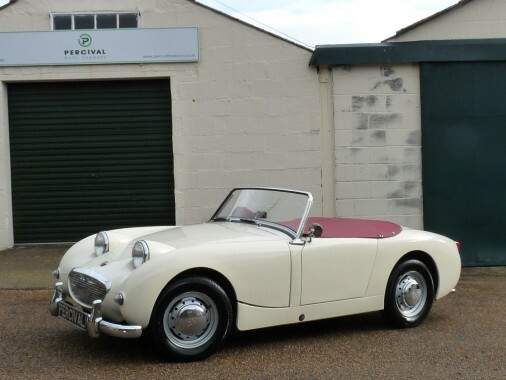 The Frogeye Sprite remains in lovely condition throughout having covered little mileage since the restoration.